St. Paul lost its tournament game last Thurs. 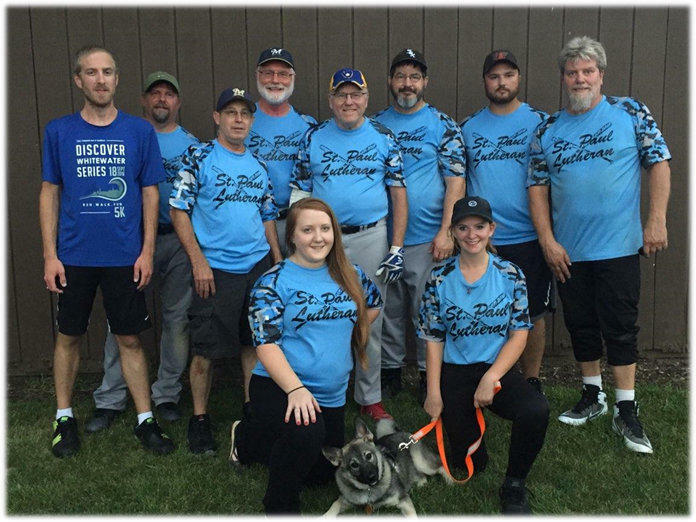 night to Beloit 1 st AOG by a score of 8-12 to close its 2018 season. St. Paul struggled this year as it posted a 3-11 regular season record. The team could not put together a consistent lineup throughout the season. Sean Behm led St. Paul in its final game with a 4 for 4 night, scoring 3 runs and including 2 doubles. James Wagner added 2 hits while driving in 3 runs. Travis Alexander and Mike Rydberg also collected 2 hits each. Allen McKillips had 2 RBI’s as did Eric Steuer with a smashing triple to the fence. AOG scored 8 runs in the first inning and St. Paul could just not recover even though they made it a respectable game. St. Paul did have the bases loaded in the 7 th with the tying run at the plate. The yearend stats shows Sam Behm led in Batting average with a .750 clip followed by Travis Alexander at .692. Mike Rydberg scored the most runs with 20 while James Wagner had the most hits with 25. Allen McKillips and Sean Behm tied with 5 doubles each while 3 players tied with 2 triples each. Sam, Travis, James and Brad Thompson each recorded one home run. Mike led the ream in walks with 8 and James produced 22 RBI’s. St. Paul thanks all the fans who attended games and cheered the team on during the 2018 season. The final stats summary is available at www.stpaulbeloit.org. The team photo taken on the last night is also posted.